SKATERS, officials and fans will dress in their acid-washed, neon and grunge finest for the next South Sea Roller Derby (SSRD) bout. 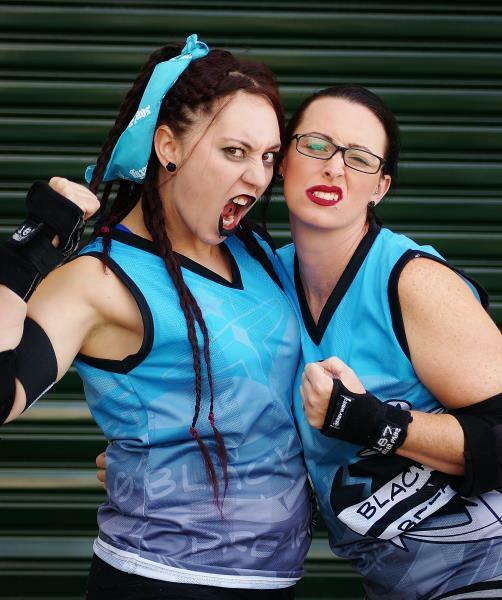 Home teams the Blackheart Breakers and the Dolly Rodgers will do battle in the ’90s-themed skate off Pump Up the Jams on Saturday 18 April. Breakers captain Harmin’ Miranda said the side only lost one game last year – to the Dollys. “So we very much want to make up for that slight slip-up,” she said. The Breakers are undefeated for the year after beating Ballarat Rat Pack in Daylesford in the first round of Battle for the Bay and fellow SSRD home team Cutthroat Charmers. The Dollys lost their first game for the year against Geelong’s Psychotics. The bout will be held at Springers Stadium, 400 Cheltenham Road, Keysborough. Doors open at 6pm for skates down at 7pm. There’ll be market stalls on site and a bar for over 18s. Tickets are available online at www.southsearollerderby.com and at the door. SSRD is a skater-owned, skater-operated amateur league. It will hold its next ‘freshmeat’ intake – to recruit new skaters – on Sunday 19 April at 12.30pm at The Shed, Greaves Reserve, Bennet Street, Dandenong. It’s $10 to take part. Email freshmeat@southsearollerderby.com or visit www.southsearollerderby.com for more information.